CHIPS-IT has long been in the shadow of its older cousin, the legendary It’s-It. That’s the original ice cream sandwich invented in San Francisco in 1928. And It’s-It has a big blue box illustrated by Paul Mirocha. Soon all that will change—Chips-It has a brand new box too. That means that instead of being sold locally in individual cellophane packages, Chips-It can benefit more of humanity by being sold by the dozen in Costco, and if all goes well, other big supermarkets. That was just the beginning for Chips-It. The new box, designed by branding agency, Gauger and Associates in San Francisco, won awards in the 2017 Graphis Design Annual for packaging design—with an illustration by Paul Mirocha. 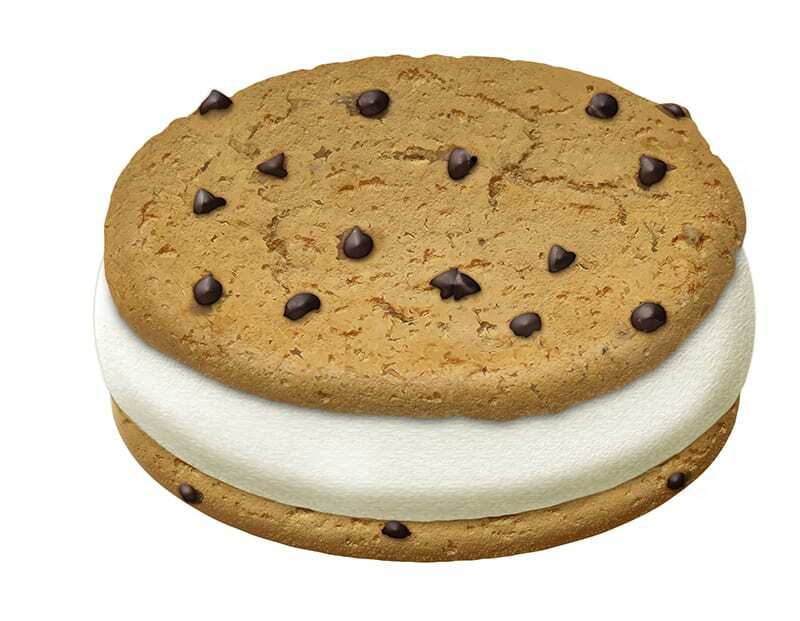 Now people are saying that using the jumbo chocolate chip cookies for the ice cream sandwich is even more of a stroke of genius than the original It’s-It. Only 6 or 8 specialists in the world really understand the theory behind it. Senior Art Director Lori Murphy worked closely with Paul Mirocha on getting the Chips-It just right for her package design. Also to get the client–a committee of Thirteen to approve it. And the decision had to be unanimous–no hung juries here. The following are some of the proofs Paul sent Lori during the long process of creating the final art. Paul’s first version of the Chips-It ice cream sandwich. Then a few people wanted it to have a bite taken out of it. OK, the decision came back: no bite. But they wanted to see the chips more covered by the dough of the cookie. Then several on the client committee wanted to see the chips kind of sunk into the dough and partially covered. Weeks went by. Ten people loved the first version, three were holding out for a variation they could not quite describe. It became a little warm in Paul’s studio. The people at Gauger too began to sweat. Finally: the verdict came back. Go back to the first version. I sent it right over, with a few finishing touches.